I hope you are having some sunshine where you are, because we’ve had quite a cold winter around here. Our driveway has been wearing a thick icy coat for a few days now, and when the sun shows up, it’s only for a few minutes a day. I am not a winter person. The days are short, it’s cloudy most of the time, the air is dry, my skin is dry, and the temperature is rarely higher than 25F (-4C). Yes, I do enjoy the first days of snowflakes gently falling down my kitchen window. I love sliding down the hills with my daughter tucked between my thighs, screaming and laughing out loud. I look forward to some cold breeze to make lentil stews, roasted root vegetables and apple pie. But after a month or so, I am done. Done as in wake-me-up-when-it’s-spring-done! But I love winter for one thing. Actually two: Comforting food and Sunday naps. Every Sunday, as I tip toe to the kitchen to set the breakfast table, I take a look outside to see how is the day shaping up. Lately, Sunday meant to be gray, snowy and cold. If we were to be in the same room at this exact moment, you would actually see me smile with content at this view. Now before you start asking yourself what is going on with this girl who seconds earlier shamelessly pretended to hate winter, let me explain myself. You see, for years now I have nurtured this vision about wintry Sundays: basically they are meant to be spent at home, around a warm, consoling meal and a nap on the couch, cuddled by my husband and a soft blanket. Sunday naps are a good way to deal with winter. And so are soups. I could eat this soup every day of the week. It is the soup of my childhood, the soup I make all winter long. The one we make on weddings, for guests, on Ramadan, or just when we crave something spicy and warming on a cold day. This soup is called “Harira”. 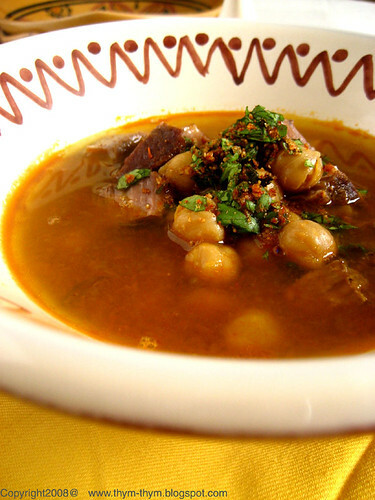 It is a spiced chickpea and lamb soup that is widely popular in Algeria, especially the west part of the country, and Morocco. The traditional way would be to cook it using lamb meat, but you can use beef meat though the taste would be different. There is something about this soup that amazes me every time I make it. It never tastes the same. Harira can be thickened using flour (about 2tbsp diluted in a little bit of cold water) or, in the case of today’s recipe, bulgur. 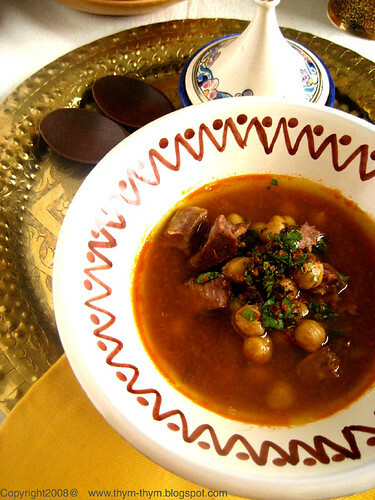 Not only the soup gets its distinctive flavor from the spices, but also from the Dersa. Dersa is a sort of Algerian Condiment. 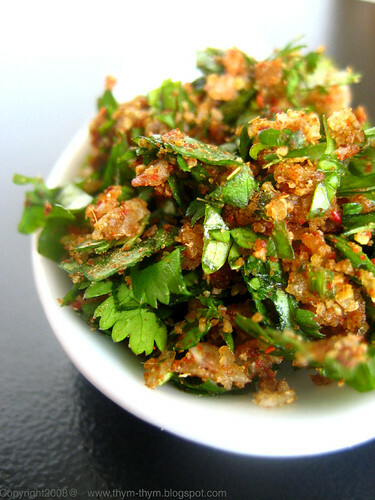 It’s mainly chopped herbs with spices and garlic that we add to the dish to finish it up. In this Harira, Dersa is made with chopped fresh cilantro, garlic, ground caraway and paprika. When serving the soup, I like to drizzle a few drops of freshly squeezed lemon juice and sprinkle some Dersa on top; because there is nothing like Harira to make me fall in love with winter again. In a big pot, heat the oil on medium heat. Season the lamb chunks and sauté them on each sides until browned. Add the onions, tomatoes, potatoes, carrots, and chickpeas. Sauté until lightly colored, about 5 minutes. Add the spices, the bunch of cilantro, the tomato paste and stir to combine. Cover with the water. Season the soup with generous amount of salt and pepper and cover with a lid. Once the soup comes to a boil, lower the heat to medium-low and simmer for 20-30 minutes, or until the chickpeas cooked and the meat fork tender. Discard the cilantro bunch and the stick of cinnamon. Put the meat and chickpeas in a plate, and, using a vegetable mill, puree all the rest of vegetables. You can also use a blender. But you will have to do it in batches, as the liquid is very hot. Put the soup back on the stove. Add the chickpeas and the scattered meat. Bring to a boil and add the mint sprig and the bulgur. Stir to distribute the bulgur. Let it cook uncovered for about 15 minutes, or until the bulgur is cooked. Season with salt and pepper if needed. Before serving the soup, make the Dersa: Using a sharp knife, or even a mortar would be great, chop finely the cilantro leaves with garlic, paprika and ground caraway. Serve the Harira in individual bowls, squeeze a few drops of lemon juice on top and sprinkle a little of Dersa. Faites chauffer l’huile dans une grande cocotte sous un feu moyen. Assaisonner la viande et faites dorer de tous les cotés. Ajouter l’oignon, la tomate, pomme de terre, carottes et pois-chiches. Faites sauter jusqu’à ce que les légumes deviennent légerement colorés, environ 5 minutes. Ajouter les épices, la tomate en conserve et le coriandre. Mélanger bien le tout. Couvrir d’eau et assaisonner génereusement de sel et poivre noir. Couvrir du couvercle et laisser cuire. Dés que la soupe commence à bouillir, baisser le feu un peu et laisser mijoter jusqu’à ce que les pois-chiches soient cuits et la viande bien tendre, environ 20-30 minutes. Jeter le bouquet de coriandre et le batonnet de cannelle. Retirer la viande et les pois chiches et les mettre dans une assiette. Passer le reste de legumes et bouillon à la moulinette. Remettre la soupe sur le feu et porter à ébullition. Ajouter la menthe et le bulgur et remuer pour bien répartir le bulgur. Laisser cuire encore 15 minutes, ou jusqu’à ce que le bulgur soit cuit. Avant de servir, préparer la dersa: A l’aide d’un couteau eguisé, ou un mortier, hacher les feuilles de coriandre, ail, carvi et paprika jusqu’à ce que le mélange soit homogène. I do feel like Mediterranean cuisine brings out the best in lamb. I love just the description of your ingredients. Just lovely! That looks and sounds absolutely delicious - and guaranteed to keep the cold at bay! I love this sort of soup. Much better than the bland blended stuff we get fed over here (England). Good Stuff. I am not a huge lamb fan, but if you did it without, I can too! This looks like something I would really enjoy! That soup sounds wonderful, but I'm definitely ready for winter to be over! I need some sun in my life! Beautiful soup! I am right with you on the Sunday naps-it's practically a tradition in our home, and yes, it's easier to snuggle down when the wind is howling outside and the temperatures are sub zero-hmm, like right now. - Salut Christine! we use it a lot in most of our cooking, especially tagines. But for its fat content, I try to avoid it as much as I can. - Aforkfulofspaghetti, thanks a lot! the spices do help in this soup to keep you warm. - Chris, thank you very much! I am sure you must have a lot of delicious soups in your repertoire as well. - Gretchen, my mother cooks it without using lamb. Sometimes she uses turkey or veal, or just chicken broth and it works perfectly. The lamb does add an extra aroma to the finished dish, but it's the spices that make this soup so warming. - Brilynn, I am with you girlfriend! Can't wait for some sun too. Oh, wait! I see some sun right now through my window...and... it's gone! I've been hating winter the last few weeks, as well... starts in October and lasts, and lasts, and lasts... freezing cold temperatures and gray, gray skies. I think I need a southern vacation right about now. But your soup looks wonderful... I just might have to try it. J'adore ce genre de soupe ! Tres comfort food pour moi . Cela fait voyager sans bouger . This is a perfect Sunday soup -- I love that it has all of my favorite "warm" spices. Nothing is better than comfort food and an afternoon nap on a winter Sunday. - Marion, my sister, who lives in Montpellier, also complains about the early warm weather that she gets there...I tell her to come here to see how lucky she is to have some sunny days. - Anne, alors tu viens quand tu veux! Mais vraiment quand tu veux! It's summer here in Australia and but I'll certainly be trying this one long before winter arrives. Thanks, Warda. I agree, I love the sunday breakfasts that I have with my family, All 4 of us bustling kitchen together making crepes (the family favorite and made mose often) Hubby at one pan me at the other and the kids on either side of us watching, waiting for little pieces. Sundays are for family breakfasts and an afternoon nap. - Shayne, I said it before a million times: you rkids are very lucky to have you both teaching them the real meaning of home cooking. They are building so many good memories with you in the kitchen. - Dhanggit, that is so nice of you! Glad you like them. - Jpcalkins, I am ready too. But the weather isn't. So until then, chickpeas and bulgur are going to be part of my weekly dishes. - Sues, this will most certainely warm you up. Stay warm there in Boston! Boston...I moved from Boston to the Central Coast of CA...if you don't like cold but LOVE food, fresh food....central coast is where you want to be. Not only can you experience great food and chefs...but you can see great food growing all around you every day. Right now is artichoke, avacado and coming into pea and strawberry season. I love seeing my food grow. And, oh ya...the wine! Amazing. Your recipe and thoughts are just lovely. To me, there's nothing more nourishing than a cold day spent indoors, with good food, warm blankets and everyone you love around you. I think that's why I love winter so much! Cette soupe est magnifique. Je sens les odeurs d'ici. A tester rapidement ! This soup looks amazing & we will be serving it to a group of fasting friends this Saturday. I love your site - Ramadan mubarik! - Baraka, thank you for your thoughtful wishes and words! I hope you and your friends will enjoy this soup. Ramadan Mubarak to you and yours as well. I just discovered your absolutely gorgeous, evocative and scrummy-looking blog and made this soup for dinner last night. All I can say is Wow!! I'm a huge fan of Moroccan food, and it looks like Algerian food is on my radar now. I'll probably write up my experiences with your version of Harira on my blog later this week, and add 64 sq ft kitchen to my blog roll post haste. Also muchly impressed that you blog biligually!